A guest post from Prof Eric Wolff, Royal Society research professor in the Climate Change and Earth-Ocean-Atmosphere Systems Group at the University of Cambridge. This week, the Royal Society published a special journal issue on the topic of climate feedbacks. This edition collects together the papers based on presentations that scientists made at a Royal Society conference in December 2014, covering the latest science and uncertainties around climate feedbacks. But before you delve into papers themselves, allow me to introduce the concept of feedbacks and why they’re so important. Human activities, most notably those causing increases in the concentration of carbon dioxide, are changing the climate. On the current trajectory of carbon emissions, very substantial changes in climate are predicted by the end of the century. If the rise in atmospheric carbon dioxide has no knock-on effects, calculating the size of those changes would be straightforward. If we doubled the amount of carbon dioxide in the atmosphere compared to pre-industrial levels, the Earth’s temperature would eventually balance out about 1.2C warmer. But reality is somewhat more complicated. Once the Earth begins to warm, it triggers other processes on the surface and in the atmosphere. These are climate feedbacks. “Positive” feedbacks will strengthen the warming, while “negative” ones will weaken it. The most recent report from the Intergovernmental Panel on Climate Change (IPCC) concluded that the combined effects of all feedbacks is likely to be significantly positive. Uncertainty around the magnitude of these feedbacks is the main reason scientists use a range rather than an exact figure when estimating how much the Earth will warm up in the future, even when we prescribe the carbon emissions. And it’s not just global temperature they affect – they also play a key role in regional climate, too. Sunset at Vatnfjorden, Nordpollen, Lofoten, Norway, Europe. © Sonja Jordan/imageBROKER/Corbis. Some climate feedbacks kick in quickly as temperatures go up. These “fast” feedbacks involve changes in water vapour, clouds and sea ice extent. As temperatures rise, more water evaporates from the Earth’s surface and is present in the atmosphere. As water is itself a greenhouse gas, higher concentrations in the atmosphere have a warming effect, creating a positive feedback. This process is well understood by scientists. One example of a negative feedback is caused by changes in the rate that temperature falls the higher you go in the atmosphere. When the climate warms, it is expected that different altitudes warm by different amounts. The dominant change is in the tropics, where the upper troposphere should warm faster than the surface. This causes more heat to be lost than would be expected under uniform warming, so this “lapse-rate” feedback is negative. More water vapour in the air will also affect the number and type of clouds that form. Here it gets more complicated: depending on their type and altitude, clouds can have a warming or cooling effect on the Earth. 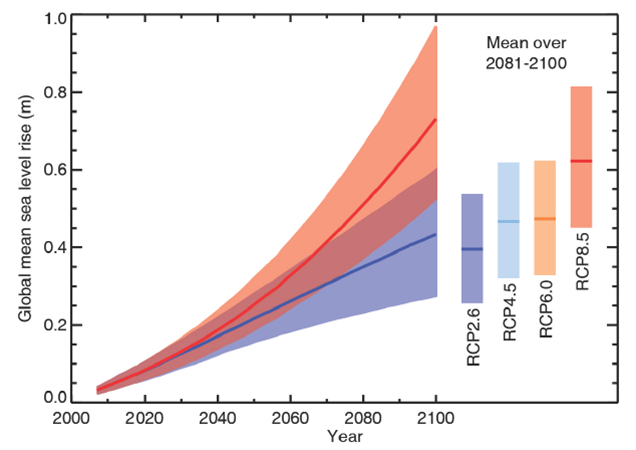 How these effects balance out remains the major source of uncertainty in scientists’ projections for near-term climate change. There have been great advances in understanding how different cloud types respond to change. But compared to the units of space in a model of global climate, individual clouds are very small, so it is difficult to represent all the cloud processes that scientists know about. In our Royal Society special issue, Christopher Bretherton’s paper looks into the latest science on this topic. Another fast feedback is changing sea ice and snow cover on land. Bright white ice and snow reflect a large portion of the Sun’s energy that hits the Earth’s surface – they have a high albedo. If sea ice and snow melt away, they leave behind a darker surface of ocean or soil, which reflect less energy, causing the surface to warm further. This positive feedback is a crucial component in producing the biggest regional contrast in the response to climate change: Arctic amplification. Declining sea ice is causing the Arctic to warm twice as quickly as the global average. Scientists have tentatively linked the rapidly-warming Arctic to extreme weather in mid-latitude countries, such as the UK, US and Russia. Warmer temperatures could also cause permafrost soils across the Arctic to thaw, with the potential to release their vast stores of organic carbon. Charles Koven and colleagues tackle this issue in their paper. Arctic tundra with frost-wedging features caused by repeated freeze-thaw processes in rocky soil, and surface water accumulation from melting permafrost on Wrangel Island, Siberian Arctic, Russia. © Jenny E. Ross/Corbis. Of course, some feedbacks take a little longer to make their presence felt. For example, the growth and contraction of vast ice sheets has been a major climate feedback from one ice age to the next throughout Earth’s long history. The albedo effect applies in the same way as for sea ice, but changes in these vast blankets of ice don’t happen as quickly. There are good reasons to suppose there is a temperature threshold beyond which the loss of much of the Greenland ice sheet becomes inevitable. The future of the West Antarctic ice sheet is also uncertain, and because much of it sits below sea level, the ice sheet is vulnerable to warmer oceans as well as higher air temperatures. While changes in sea level will play out over millennia, actions taken or avoided in this century might commit the planet to seeing them happen. Feedbacks triggered by rising carbon dioxide can also occur within the carbon cycle itself – a topic covered by Pierre Friedlingstein in his paper. More than half of manmade carbon emissions are currently absorbed by the ocean and the land biosphere. However, as the oceans warm, their capacity to store carbon could diminish. Likewise, how much carbon dioxide that trees, plants and soils can absorb is likely to be different in a warmer world. It is clear that positive feedbacks in the carbon cycle have been very important for the change from ice ages to warmer periods. Finally, in modern times there is a new kind of feedback: humans. We are, in effect, a whole category of our own. How we change – or don’t change – our behavior in response to climate change will play a major role determining in the scale of global temperature rise in the coming decades and centuries. Scientists use three parallel lines of study to estimate the strength of feedbacks. First, there are studies that aim to uncover how different feedbacks actually work. These contribute the detailed knowledge scientists need to improve climate models. Second, there are modelling studies that show how the different feedbacks combine to affect global climate. And, third, there is research into Earth’s past that provides examples of how the climate has responded to natural forcings, such as volcanic eruptions, or natural emissions of greenhouse gases. Scientists have greatly improved understanding of many of the major feedback processes that have affected past, and will affect future, climate change. Quantifying the magnitude of the major feedbacks is still difficult, however. So, for the time being, scientists will still present climate projections as a wide range, but we’re working on making it narrower. Photo: Schareck ski region in Austria. © Gonzales Photo/Christoph Obersch/Gonzales Photo/Corbis. This guest post is based on the following open-access article: Wolff, E.W., Shepherd, J.G., Shuckburgh, E. and Watson, A.J. (2015) Feedbacks on climate in the Earth system: introduction, Phil. Trans. R. Soc. A, doi:10.1098/rsta.2015.0146. What are climate feedbacks and why are they so important? Climate sensitivity | April 4. 2016. Climate sensitivity | May 5. 2011. Climate sensitivity | November 11. 2013. Climate sensitivity | December 12. 2016.